I received this brush in exchange for my honest review on this product and let me tell you I was impressed! 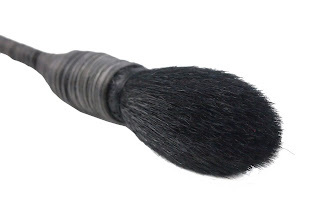 I have been dying to buy this type of brush from Nars or Hakuhodo. However I refuse to spend $50 bucks and up for said brush. While I might be a makeup junkie, I still need to count my pennies. So when I realized I was going to be given the chance to review this brush I jumped on it. This brush is not like your typical brush. It comes wrapped in what almost seems like Bamboo wire. Its much smaller then your average brush, but fits perfectly in your hand. The brush bristles is made of 100% goat hair which isn't cheap. Its cut and angled in a dome shaped way which works great to fit right into the hallow of your cheeks for contouring. Or applying blush right on to the apples of your cheeks and not getting into your high bone messing with your highlighter. Since the brush is pointed, you can also contour under your chin, forehead and nose with no problem. Moreover, due to the smallness of the brush, it wasn't to wide so that your contour got all over the place. I noticed no shedding of the brush hairs when using for application. Also, though the hair is very soft, but the bristles are tightly packed in such a way that they are strong enough to apply your makeup without fraying or losing it shape. I would so recommend this brush if you are want to buy one of the Nars or Hakuhodo ones, but don't want to spend a weeks pay check on it! FTC: This brush was given to me for review. I was not paid in any way for my opinion. Strobing! What is it! How to Achieve it! So now that contouring and highlighting has been made famous again by Kim Kardashian, lets talk about strobing. So what is strobing you ask?! Well its highlighting...plain and simple. Nothing more and nothing less. The difference between this and highlighting and contouring is that there is no contouring done...period. Outside of that, there is nothing new or magical about this technique besides the name change. So now that we cleared that up, lets talk about strobing. 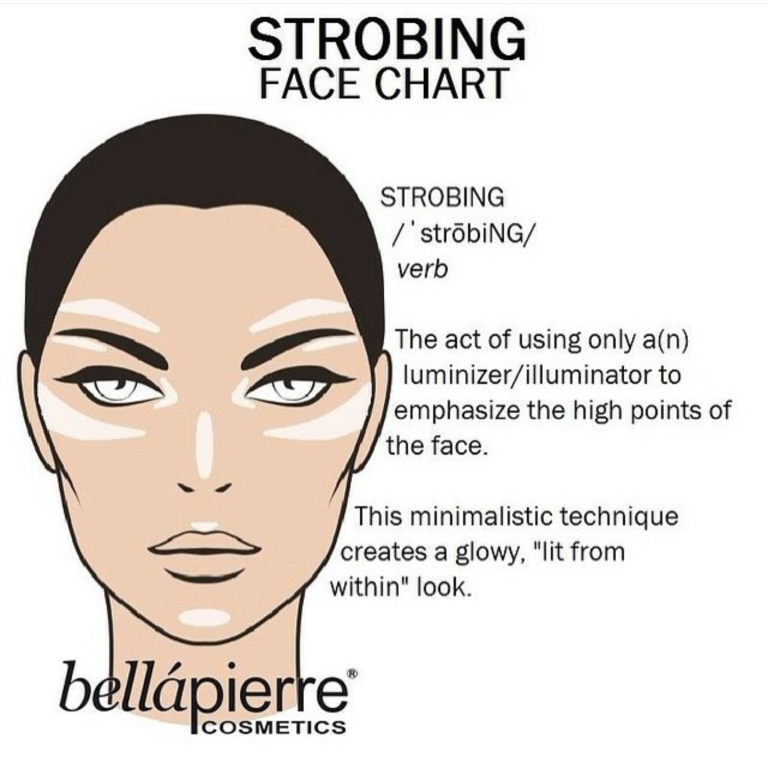 Strobing is applying highlighter to the high points of your face where light natural hits it. Those high points are the tops of the eyebrows, underneath your eye brows at the end tail, in the corner of your eyes, underneath your eyes, down the bridge of your nose, a little bit on your forehead, your cupids bow and your chin. These points are where light naturally hits the face and light up in a manner to make you look angelic whether in real or artificial light. Strobing is also the use of highlighters in order to cause a "natural" effect to make you look like you are glowing from within. Strobing also makes the face look dewy, healthy and all around just naturally lit. Its great if you need a "wake me up" look when you are far from awake. First, only people with dry, normal and somewhat (maybe) combination skin can achieve this look. If you have oily skin, stop reading this and move on. If you attempt this technique you will probably look like a melting pot due to all the creams needed. Which brings us to our second point. ONLY use creams! If you use powders (besides your setting and under eye powder) this will not look natural. I just saw a famous youtuber do this look using powders and it totally did not look right at all. Third, you need to have almost next to prefect skin. If you have acne, bad scarring and so on, this will not work for you as your base needs to be sheer to minimal coverage in order to allow the highlighting and the natural glow of your skin to show through. Fourth, you need to keep your eye makeup matte, neutral and natural. So skip the shimmer, sparkles, glitter and overdone eyes for this look. Which brings us to our final point. Strobing needs to look "natural" whatever that means in the world of makeup! So basically you need to look like you are lit within and thus it shows on your face like an angel, unicorn and fairies. If over highlighting is not for you then this rainbow type technique won't work either because of the amount of fairy dust needed to achieve the look. 1. USE PRIMER! I don't care which one you use, just use it. With the amount of cream products going on your face, plus the fact it's summer right now; if you don't use primer your face will melt. So use a good primer to keep this stuff on your face all day long. My favorite is Bareminerals Prime time which works great to hold your makeup all day long, or Hourglass Veil Mineral Primer which is amazing for those with oily skin who still want to produce this look regardless of the fact! 2. You need a face illuminator to achieve the strobing look. I for the longest use to mix in my Victoria Secret face illuminator with my foundation every time I wore makeup. However, this VS product has been discontinued and now I have moved on to MAC Strobe Cream which can be applied before your base or mixed in with your base. How ever you like to do it is up to you, just as long as you are using some type of illuminator in order to give your face that look you are going for in strobing. 3. Your base must be either a CC cream or sheer to minimal coverage foundation. You cannot use heavy foundation and attempt to get away with this. Heavy foundation does not give the appearance of natural looking skin. Stick with either a CC cream like It Cosmetics CC+ Illumination Foundation or a luminous foundation that offers a sheer coverage. These types of CC creams or foundations will give you a lovely dewy, glowing angelic look to your skin without the heaviness, glitter or sparkle. 4. 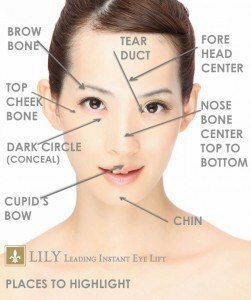 Use concealer before or after applying your CC cream or foundation. You can't highlight your eyes with dark under eye circles. If you attempt to this, you get a dark shadow underneath your eyes which will accentuate that area making it look awful and shadowy. A good concealer that covers up your dark under eye circles is the Chanel Correcteur Prefection. This concealer works magic to hide any and all imperfections, but doesn't cake or settle in the fine lines around your eyes and looks natural once set with powder. 5. After applying your concealer or base (depending if you put your concealer on before or after your base) you need to highlight your under eye and the other areas shown on the chart above. This is what I call "pre highlighting" because the real over the top highlighting is yet to come! Pre highlighting helps to set the stage for the real highlighting part by allowing these area to be a shade or two lighter. When pre highlighting, you need to find a highlighter that is a 1-2 shades lighter then your skin in order to make the area appear lifted, light and dewy. The product I love to use for this is my MAC Pre + Prime Highlighter. Not only does this work in concealing (a little) but it really gives a lift to the eyes and other areas when placed and blended in accordingly. 6. Set your concealer/highlighter underneath your eyes with the Laura Mercier Secret Brightening Powder. This stuff is literally magic because not only does it help to stop your concealer and highlighter from settling into the fine lines underneath the eyes, but it also helps to give your eyes the most beautiful but natural brightening effect without dampening the highlighting effect of your highlighter. 7. Next, apply a natural looking cream blush on the apples of your cheeks that is a bit of a rosey color depending on your skin tone. For cream blushes I use the Josie Maran Argan Color Stick in the shade Love. I love how natural looking these blushes go on and really blend into your skin leaving you a lovely rosey glow that goes with any strobing effect. Again, we want natural right, so a powder blush really won't work here. Plus you don't want to mix powder with creams. The rule is "creams before powder" and mixing them will cause the powder and cream to break down. 8. Now this is where the whole look gets pulled in; the serious highlighting part. Once you have finished applying your blusher, COMPLETELY skip contouring here aka bronzing. Put that bronzer down and walk away just in case you accidentally reach for it out of habit. Instead grab your LIQUID highlighter and just like with your MAC Pre + Prime, apply this liquid highlighter all over the high points of your face (as note in the chart above) WITH THE EXCEPTION OF UNDERNEATH YOUR EYES. Remember these liquid illuminating highlighters will not fair well underneath your eyes. So put it everywhere else BUT underneath your eyes as that part has already been concealed, highlighted and set with powder. You can apply it with your finger tips or a nice small duo fibre brush and make sure it blends in well so no streaks are left behind but that it stands out to the point where you ALMOST look like a disco ball aka angelic look. Stay away for glitter, shimmer and sparkle highlighters and stick with those that give off more of a natural looking light effect. I love using L'Oreal True Match Lumi Liquid Illuminator to produce this look. Not only will it give you the most amazing glow you will ever see, but it comes in three different colors to flatter very fair skin gals to darker tone beauties! It comes in three different shade ranges that should work for just about most people! 9. At this point, apply a little bit of powder to your face to help set the whole look in. Make sure to use a VERY FINELY MILLED powder in order to avoid getting that powdery cakey looking effect. Not all powders are made the same, so look for a finely milled one to achieve this effect. I just love Chanel Poudre Universelle Libre which is so finely milled that you need a very up close and personal mirror to see the powder on your face. From far, unless you go all bakery-powder-cake-wild on your face, you won't notice it when applied. Best place to use it is on your T-zone as the majority of us produce some form of oil in that area. In case you over due it with the powder, don't wipe it off. Just use MAC Pre + Prime Fix+ Spray to help get rid of that powdery look. I love this spray for that reason along which I always use right before setting my makeup with a setting spray. 10. Finally set your whole look with a setting spray. My favorite is Urban Decay All Nighter Setting Spray which not only hold your makeup, but makes it last without smudging, running or moving for hours. You seriously need a setting spray for this look in order to lock in the creams. Due to the over the top (but natural) highlighting and the amount needed, a setting spray will avoid anything from slipping, moving and transferring. So there you have it, the 10 steps you need to make this look last! Have you tried strobing before? Let me know which products you love using! Stay tune for my Youtube video on this!! I hardly ever buy drugstore makeup. I don't hide that fact and make no apologies either. The reason why I hardly don't buy drugstore makeup is because you don't always have access to touch and play with the products. I prefer buying ALL my makeup at Sephora and department stores because there is always a sales associates available to ask questions, touch the product and swatch the colors. I dislike buying something that I can't feel in regards to texture, nor that I can swatch in order to see how pigmented it is. What you see in the pan isn't always what you get when applied to your eyes and if this has ever happened to you, then you know how disappointed you feel when you been duped! I heard about Milani Cosmetics from watching Youtube. Currently in Canada you are very hard pressed to find Milani products anywhere. I was informed that I can possibly find them in my local big chain supermarkets. However after currently having my fourth baby "ain't no one got time for that!" So I decided to order them online from beautyjoint.com because they had the BEST shipping rate over any other company (including Milani) that I saw for Canada. These eyeshadows claim to be a gel that convert into powder when applied. While they don't feel like gel when touched, however they are soft like something I have never felt in an eyeshadow. They are very velvety smooth and almost creamy to a point. Many people state that they like applying them with their finger. But I prefer my makeup brushes because for me, nothing gives you a flawless look like quality brushes. I fell in love with four out of the 30 colors from this collection. However since I had no choice but to order these online, I decided to buy only two in case I hated them and wasted my money. I decided to buy Bella Gray because of its beautiful darker tone gray color with a hint and I mean a hint of silver. I love doing a smokey eye, and nothing looks better then when you hit it with a gray tone color. My second choice was Bella Navy. Now I know that color is totally out of my comfort zone. However I recently saw Jaclyn Hill do a blue and bold eye tutorial and I completely fell in love with the dark navy shadow that she used. I decided to replicate the look with a softer blue and wore it to a colleagues retirement party. Even up to the guys were complimenting my eyeshadow. However I still felt that I needed that dark navy blue color. So when I saw that Milani offered the same color range I was looking for, I totally bought it. These arrived to my house in about a weeks time. I decided to wear them at a dinner party I threw at my home for a dignitary (fancy, I know :) old friend of mine who came to visit. I used the Bella Navy with my Too Faced Semi Sweet Eyeshadow Palette and it looked amazing. I used the black and brown colors in the palette as my lid and crease shade and then applied the Bella Navy on top for a rocking look. They held on all night without flaking, smudging, creasing or moving. These eyeshadows literally feel like butter. When you touch them, they feel like a gel-like powder texture that "dries" to a nice normal eyeshadow powder finish. It has very very little fallout and blended in nicely. With one swipe of my makeup brush, it grabbed the color with no problem. They are super pigmented and if you wet the brush, they become a more vibrant hue. I literally was amazed on how awesome these colors stood out either wet or dry and how smooth they applied and how easy they were to blend. The packaging is a gold like circle compact. Its small and basically the same size of the shadow. You can depot them and put them in you Z-palettes, however google youtube for that info, as you will have a hell of a time doing this. It would be better if Milani made them easy to pop out. Nonetheless, the compact is small, sturdy and you can throw it in your travel bag for on the go without being to concerned about it shattering. I find the packaging to look pretty fancy and really makes the eyeshadow look elegant. It doesn't come with a small mirror inside the case, so keep that in mind if you plan to travel with this. I would totally pick these up in the shades you like and try them out. I bought them for under $5.00 a shadow. They are really worth considering. So there you have it, my review on Milani's Bella Eye Gel Powder Eyeshadows.